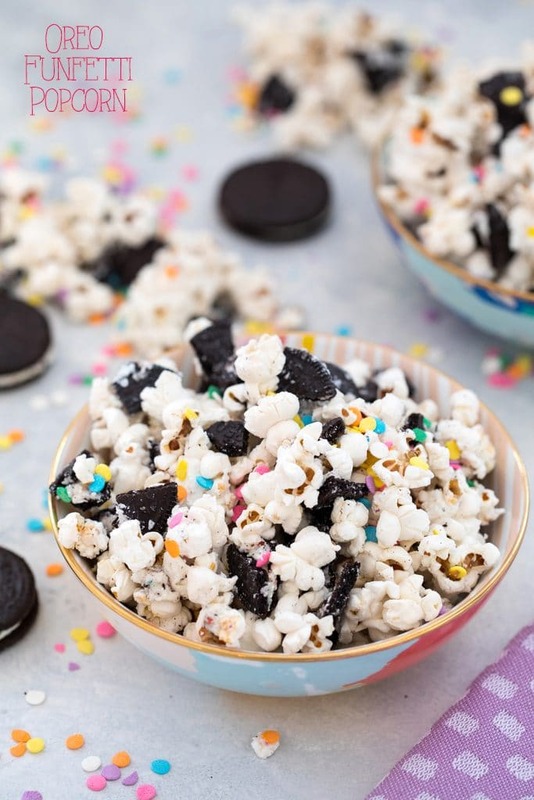 This Oreo Funfetti Popcorn is also known as birthday cake popcorn or party popcorn. Packed with sprinkles and Birthday Cake Oreo Cookies, it’s a quick and easy dessert perfect for bringing to parties! When I was in middle school, I set a bag of popcorn on fire in my kitchen microwave while preparing an after school snack before heading to dance class. Probably needless to say, my parents were not exactly thrilled that the entire house smelled like burnt popcorn for like a week. And that I almost burned the kitchen down. I actually think the microwave shorted out, which is probably the only thing that really saved us. Middle school and I couldn’t even handle the microwave… Ack. To be fair, popcorn can be tough since all microwaves are a bit different and the package might not always have the best recommendation. I think that’s why they invented the popcorn button. But here I am now just making excuses for my 12-year-old self. Well, I’m so happy to say that I have come a long, long way since my middle school days. To the point where I now make popcorn on the stovetop, which would have been a serious danger back in the day. Canola oil and direct heat? Let’s just say, I never would have been left alone again. So far, I have experienced no danger in my stovetop popcorn making adventures, but with images from last night’s episode of This is Us locked in my mind, I may need to refrain from using any kitchen appliances for the next 10 years or so. Yikes. Anyway, If there’s one thing I know we all love, it’s sprinkles. I mean, you probably would have abandoned my blog 35 years ago if you didn’t like sprinkles. Also, every time I post a picture to Instagram Stories that involves my sprinkles lamp, I get a million questions about it (it’s featured in this post in case you’re wondering!). So, I’m pretty sure we’re all in this sprinkles love boat together (OK, a sprinkles love boat sounds half majorly creepy and half really awesome). And sprinkles in popcorn scream “party!” especially when there are Birthday Cake Oreo Cookies included, too. 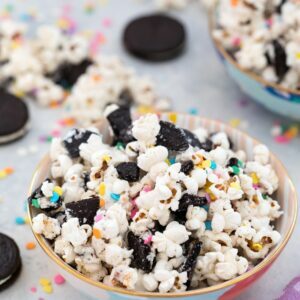 I first made this Oreo Funfetti Popcorn years ago (during my Wilton partnership) and have continued to make it for any party where I want to bring something fun, but don’t have a whole lot of time to spend in the kitchen. It’s incredibly quick and easy and really difficult not to love. Like I mentioned, I mainly pop popcorn on the stovetop these days, but you can certainly use microwavable popcorn. If you do, you should know that I used 10 cups of popped popcorn in this recipe. You also need candy melts! I generally use Wilton, of course. When I first made this recipe I used their marshmallow candy melts, but since they were limited edition, it’s sadly tough to find them these days. Luckily, any of their vanilla versions taste very similar, so that’s what I used here. They have all different shades of white and any will work, though I like bright white best. Also, I used these sprinkles (affiliate links!). 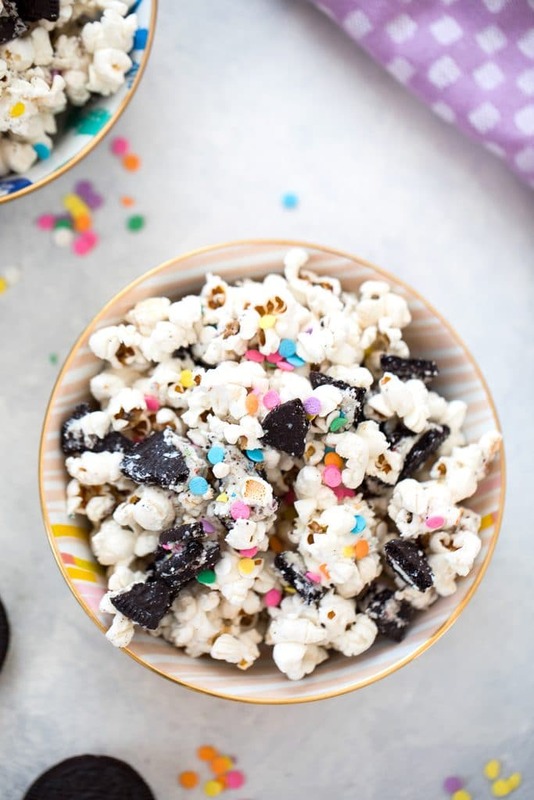 Once you pop your popcorn and melt your candy melts, you simply drizzle the melts over the popcorn and toss with crumbled Birthday Cake Oreo Cookies and sprinkles. And you will never, ever eat savory popcorn again. OK, that’s not true because sometimes when you’re watching a movie you might crave a buttery, salty popcorn. Or perhaps one with extra tabasco and parmesan cheese (obsessed). But this dessert popcorn will shoot way up on your list of top popcorns in the world. You may even find yourself making excuses to make it… I mean, I’m not going to a party, but if you consider Saturday night in and of itself a party even if it just involves PJs, the couch, and a glass or wine… There’s really no bad time for funfetti popcorn. I also think that Birthday Cake Oreo Cookies (basically Funfetti Oreo Cookies) are the best Oreo Cookies and I will almost always choose them over others. I just realized they have a golden version now, too… So, if you’re making this popcorn for someone who doesn’t love chocolate, those could totally work here. It’s a pretty simple recipe and the options are endless! I also have to include this sad photo from one of the first times I made this funfetti popcorn back in the day. 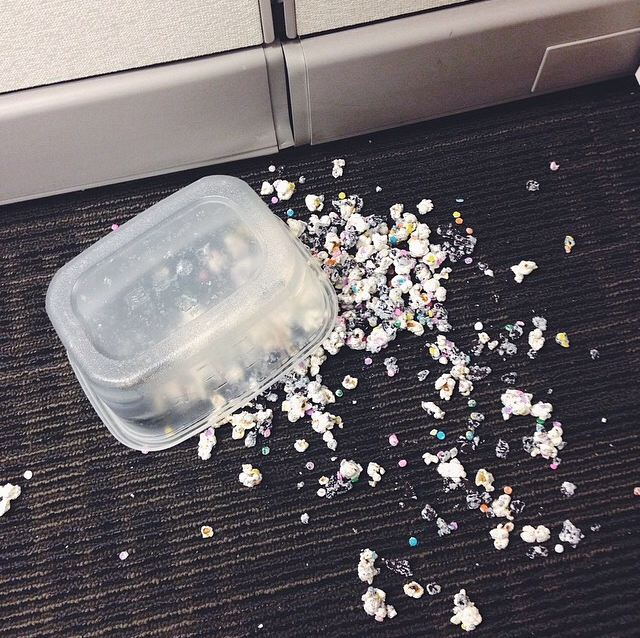 I brought it into the office to share with my co-workers and it tragically fell to the floor. It was a sad, sad day and one we hope is never repeated. I can’t totally recall, but I want to say that most of that popcorn was eaten anyway. Worth it. I’m happy to say that my most recent batch of Oreo Funetti Popcorn all made it in one piece until its final resting place. Thank goodness. What’s the best popcorn you’ve ever had? 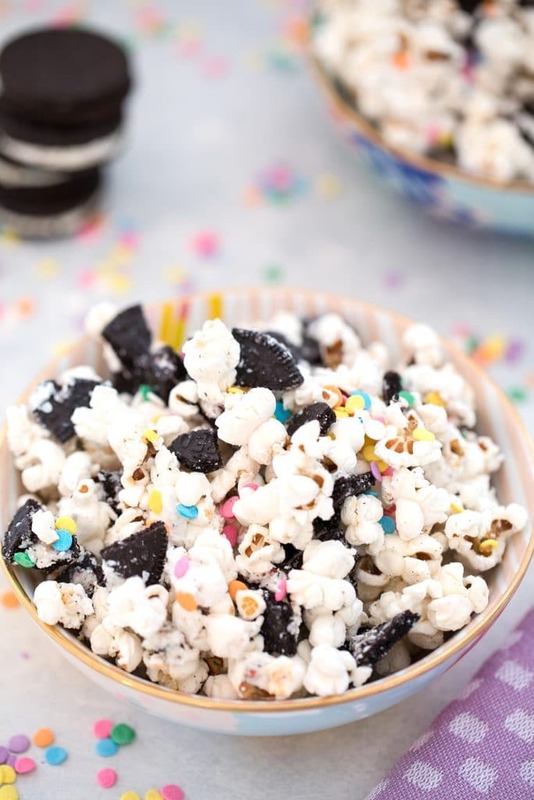 This Oreo Funfetti Popcorn is also known as birthday cake popcorn or party popcorn. Packed with sprinkles and Birthday Cake Oreo Cookies, it's a quick and easy dessert perfect for bringing to parties! Put oil and popcorn kernels in a large pot over medium-high. When the first kernel pops, cover the pot and remove it from the heat for about 30 seconds. Place pot back on the stove and once kernels start popping, vigorously shake the pot back and forth, keeping it on heat. Once popping slows, take pot off the heat and remove cover. Put popped popcorn in a large bowl. Put candy melts in a microwave safe bowl and place in the microwave for 1 minute at 40% heat. Stir mixture with a spoon and then repeat regimen at 30-second intervals, stirring in between each one, until candy melts are fully melted. 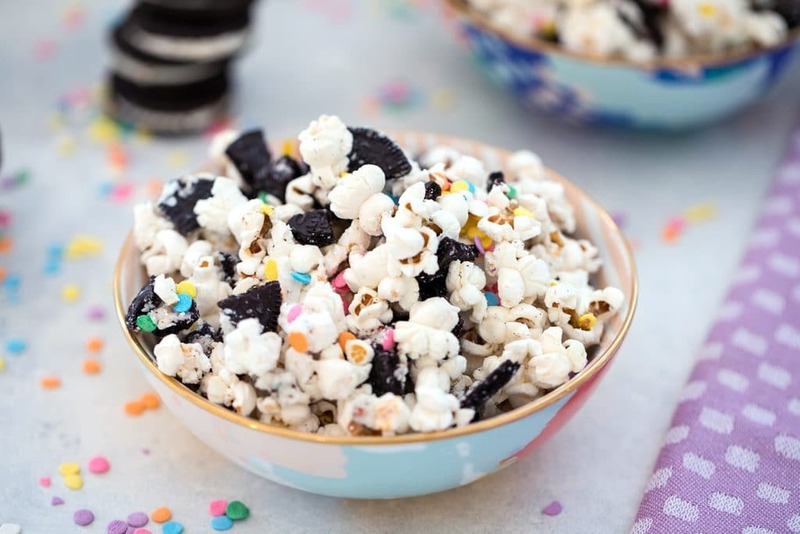 Drizzle candy melts over popcorn and toss with crumbled Oreo Cookies and sprinkles. If you prefer to use microwavable popcorn, use 10 cups popped. 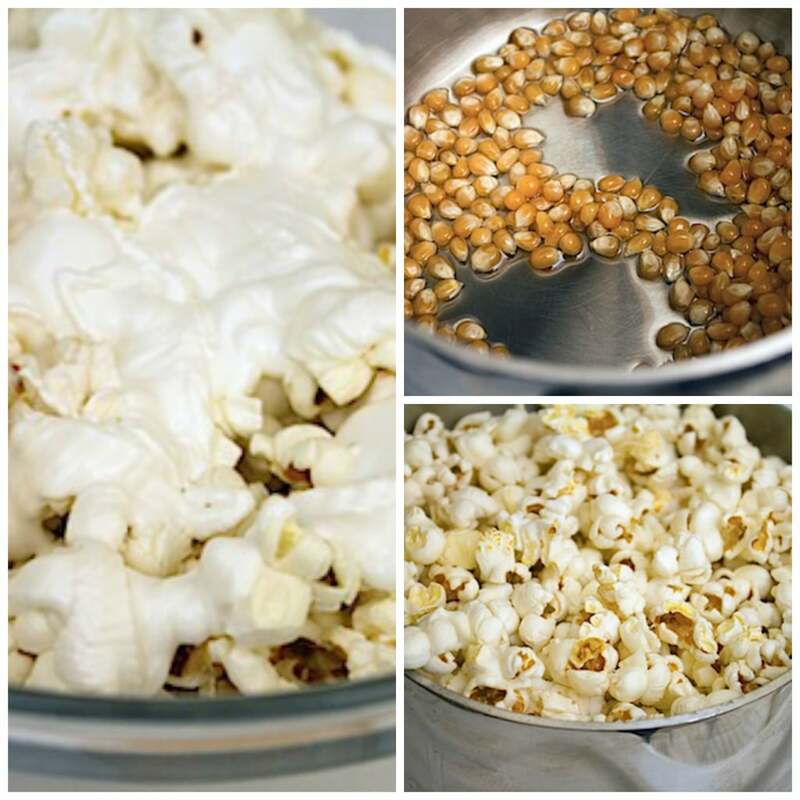 Store popcorn in airtight containers at room temperature and enjoy as soon as possible. 15 Responses to "Oreo Funfetti Popcorn"
This is insane! And it’s so bad that I want a bowl for breakfast right now. That fallen popcorn made my eyes tear up. RIP indeed. Every spring my family and I scope out the street fairs in NYC. There is a kettle corn stand that makes pretty much any flavor of kettle corn you can imagine. I always tell myself I will buy a new flavor but I always look lovingly at the peanut butter and take it home with me! It gets me every time. Although I haven’t set a kitchen towel on fire, I have melted our microwave plate cover by setting it on a hot burner – whoops! Also, this popcorn looks amazing! I used the Marshmallow candy melts for popcorn a few weeks ago but never thought to add Oreos. YUM! So sad that the leftovers fell to the ground! 🙁 But this looks amazing – I love the combination of salty and sweet. Oh no popcorn plummeted to its death! The best popcorn I’ve had is chicago mix. The picture on the floor basically made me cry. This is too pretty and delicious to waste! Oh my gosh I want to faceplant in this! Sweet + salty is such an addictive snack! Anything with Oreo cookies is awesome. Unfortunately I eat popcorn with wild abandoned and Oreos if hey are anywhere in my reach—-which I make every effort to make sure they stay on the grocery store shelf. There would be NO leftovers to dive bomb to the floor in my house. For real?? I need this in my life..and stomach! Love this popcorn! It looks so good. I’ll have to adapt the recipe because we don’t have birthday cake Oreos in the UK. But non the less it’ll be amazing with regular Oreo’s! What a perfect combination! So excited to have this recipe for future parties!